EISA. The European Image and Sound Association is a conglomerate of (some of) the world’s finest tech journalists who annually bestow awards on the best in in-car electronics, mobiles devices, home theatre, photography and hi-fi equipment. That’s the news but what’s the story? A good proportion of this year’s award-winning amplifiers advance the tradition of their sub-category to put more than one function in a single, often stylish chassis. In other words: over half a dozen pieces of Future-Fi. The Chord Electronics Hugo 2 gives other DACs at its price point (and beyond) a serious run for their money (especially on detail retrieval and soundstaging/stereophony) but adds beefy headphone output and a battery for a full portability to its port-holed chassis. Its bug-eyed buttons light the way so that this DAC/headphone amplifier goes where you go. Ergo, Hugo. More information here. Wallet won’t run to a Chord Hugo 2? iFi Audio’s xDSD portable DAC/headphone amplifier is a cheaper, smaller and considerably more stylish alternative – easily the best-looking product ever to spill from the Southport headquartered manufacturer – and one that adds aptX Bluetooth and MQA support to its array of digital inputs. Video here. The Pro-Ject Stream Box S2 Ultra has only just begun shipping but I’m told that EISA committee members have been hands-on with pre-production units since February of this year. This Roon Ready streamer’s outward aesthetic might err toward the pedestrian but inside is a stripped down Raspberry Pi with customised HDMI video output and low noise power supplies, augmented by a custom USB output that can double as a USB reclocker/de-noiser. More information/video here. The Micromega M-One M150 integrated amplifier puts Class A/B loudspeaker power – unexpected given the form factor – alongside DAC, phono stage and room correction in a single low profile chassis that, like the Devialet Expert series (also from France), looks like no other integrated amplifier. Black or white are a standard issue but any RAL colour finish is available for an additional fee. More information/video here. 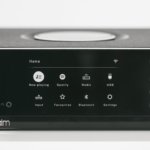 The Naim Unit Atom is one of the finest audio products ever made. There: I said it. Why? 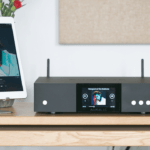 A shoebox chassis takes the hassle out of streaming with seamless interchangeability between vTuner radio, Tidal, Spotify Connect, Roon and – far less common – Chromecast. And its top deck volume wheel oozes luxury. Just add passive loudspeakers and live happily ever after. More information/video here. The Primare I15 Prisma puts a DAC and streamer in front of a 60wpc amplifier for Bluetooth, Apple AirPlay, Spotify Connect and Chromecast connectivity. The Pioneer A40-AE integrated ditches the streamer in favour of an MM phono stage; digital and turntable hook-ups in a pedestrian-looking but affordable unit. Lastly, and perhaps the wildest of the lot: the Pro-Ject Juke Box S2 is a turntable that challenges purist sensibilities with a bespoke fit phono stage, 50wpc loudspeaker amplifier and Bluetooth streaming module fitted to its undercarriage. The EISA awards for 2018/19 will be formally presented to manufacturers during IFA Berlin 2018 at the end of August.